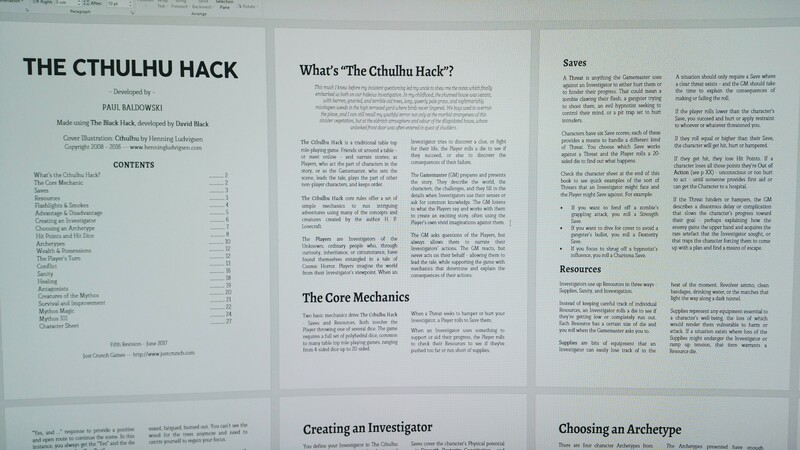 Well, writing on The Cthulhu Hack v1.5 definitely got started. That’s all I can say for the moment. Since running adventures over the weekend at UK Games Expo, I have had the chance to pull some thoughts together with my existing notes and get going. For the initial sweep, I have concentrated as much on removing material as adding new options or clarifications. Over the course of the year, my pitch at the stall and the gaming tables has tightened up – and when I wrote the Cthulhu Hack quick start / demo Nocturnal Rites, it provided a cool way to force me to get the core principles down in short form. If you want to hear more and see regular updates, hit Join on The Cthulhu Hack Google+ Community page!